This mission trip was very different from others undertaken before. The only itinerary we had were the dates of departure and arrival to Vientinane, and again another date for departure for Kuala Lumpur. We had a name of a person to contact, and that transport and accomodation was available to us. Another entry was on Sunday, to meet up with Pastor going to an undisclosed destination, for service. With only this information we set off, trusting inGod and His Holy Spirit, to provide for us. Our mission was to make contacts , find ways to obey and do His commands, to spread His words , lay hands and heal the sick, cast out demons, to heal the sick physically and spiritually to bring His children to Him. When God plans for us to do His commands, He makes provisions for us which we do not know. At the departure lounge of KLIA 2, Derrickmet an old friend, wh o is now exporter of tea in Laos. He , when he heard of our mission made contact for us to meet up with a new convert. 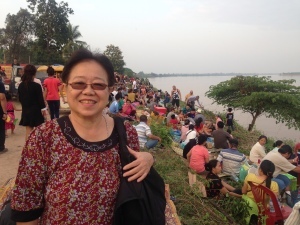 This sets up a chain of events that neable us to meet with other pastors, to hear what they had to say about the words of God in Laos, which is a predominantly Buddhist country and where open worship to God is disallowed. 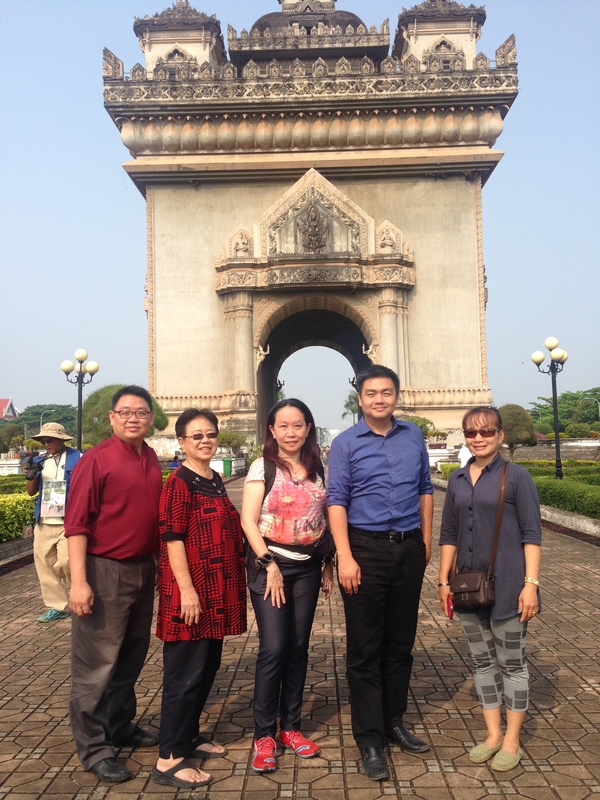 All in all, we met up with five pastors from three denominations and visited 2 churches. One in Vientiane and another, one hour drive away. It was at the second church that we had service on Sunday, and healed the sick, many signs and wonders were witnessed on that day. We had a short devotion with some staff, who worked with Ling Nee, and here The Lord healed the shoulder pain of one, She also asked for prayers for her father. On Saturday evening, we went to a house to lay hands a=on a lady who had a knee pain and difficulty in walking. she was healed by the Lord and could walk up the stairs easily. We had dinner with her daughter and family on Sunday evening. It was an experience in Laos to see shrines everywhere, at every corner and streets, where old buildings intermingled with some newly constructed and designed buildings, not more than 3 to 4 storeys high. The newer buildings had balustraded balconies, facing the road and were painted in pastel colours, in contrasts to the web dew structures of some shops. Frangipani trees line the road and I even saw mango plants , papaya plants and even banana plants growing on the road fronts in the older parts of Vientianne. the trip out on Wednesday night to see the Naga Fireballs at Lon-Chia, an hour drive , eastwards from Vientiane, to the Mekong River , to see this yearly phenomena. It was the night of total human eclipse. We saw the emergence of the moons to its full moon, from 7 pm to 10.30 pm and three fireballs. we did not know what to expect. We turned and scanned the darkd nights, upon shouts from the locals and there it was a red ball arising and dissapeared within a few seconds. That night was a Laotian festival where candle lit hot air baloons were released, with little baskets of flowers into the mekong river. We were entertained with loud Thai music with pulsating beats and dinner of fired grasshoppers and lavva, skewered meat and fried noodles. We were hosted by our newly met Laotian friends to try laotian food at Merci Restaurant, really really hot with chilli padi and local herbs of meat, fish and salads. I could feel my tongue and lips swelling up!! On Thursday, we had lunch at Dao Tea Tree room , with fine Laotian dining cuisine, to sample rice rolls with prawn and pork, dumplings of meat and salted eggs, rie, vegetables wraps of 3-4 types of herbs, with sweet sour fish sauce and vineger and also thick peanut sauce. This was concluded with green tea milk drink , unforgetable hospitality. Next was a lesson on tea drinking, and the varieties of tea available, courtesy of Derrck’s friend who treated us earlier to laotian beef soup and noodles. We event took back with us a bagful of tea samples.